Mark Dewey pitched six seasons in the major leagues for the Giants, Mets and Pirates, winning 12 games and saving 8. Now the pitching coach for the minor league Washington Wild Things and for Emory and Henry College, he kindly answered my questions about baseball cards. "I have a baseball card from my time with the Pirates that has a picture of me on the front, but a picture of Jeff Ballard (one of my teammates) on the back. 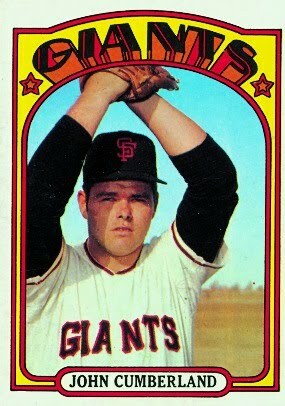 I did collect as a child, but have not for many years--though I do have a complete set from the 1987 Everett Giants." Thanks! I couldn't find the card with the Ballard photo (perhaps it is 1994 Fleer Update?) but here is one with Dewey, from 1995 Topps. Mike Caldwell pitched fourteen years in the major leagues, winning 137 major league games. 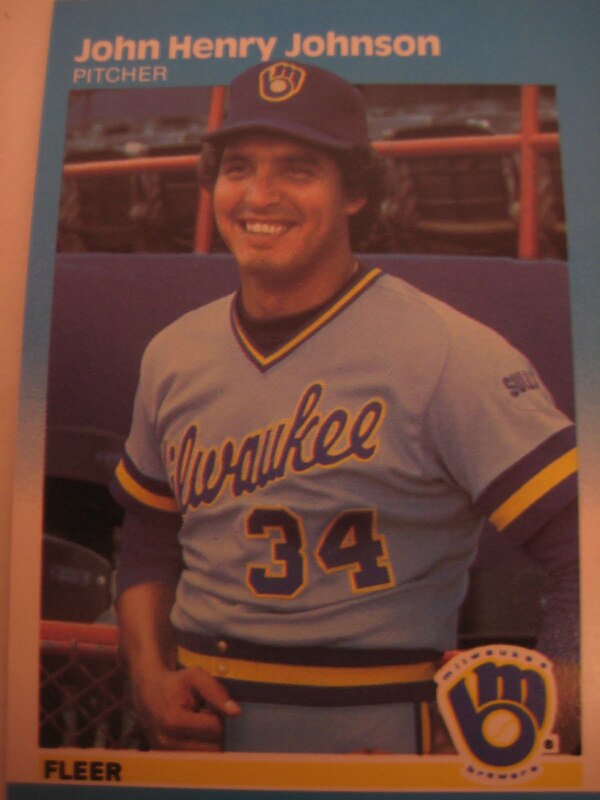 His best seasons were with the Brewers in 1978, when he won 22 games and finished second to Ron Guidry in the AL Cy Young voting, and 1982, when he won 17 games in the regular season and two more in the World Series. Now the pitching coach for the Scottsdale Giants in the Arizona League, he kindly shared with me his thoughts on his favorite cards. 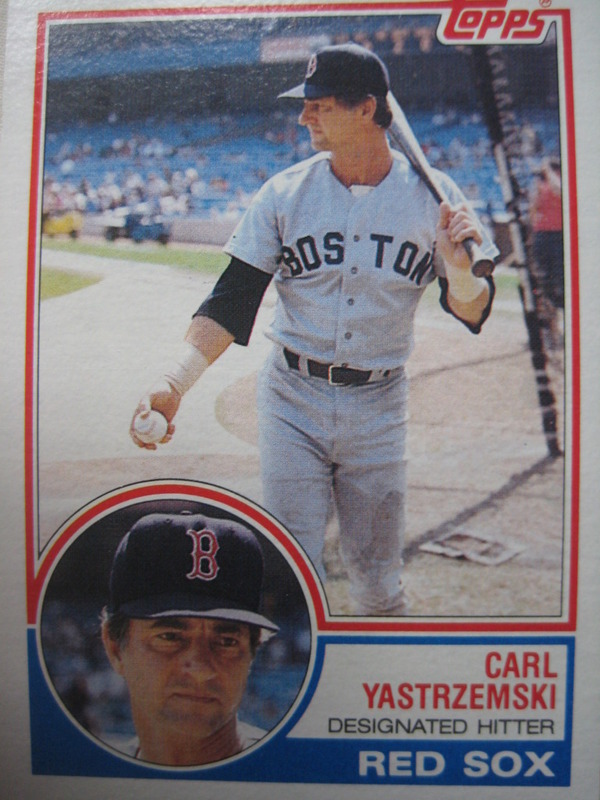 "'Favorite of myself - 73 Topps--my 1st card. 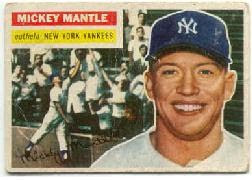 My two favorite cards are of Mickey Mantle & Willie Mays." Thanks! I don't have the 1973 card, so here is one from my collection, from 1983 Fleer. In this very interesting 1981 article from Sports Illustrated, the magazine examined the impact of the two new card manufacturers, Donruss and Fleer. It has some interesting commentary from fans, players and photographers of the time. There are a lot of interesting stories. For example, they are interviewing Topps photographer George Heyer while he takes pictures of the Reds. 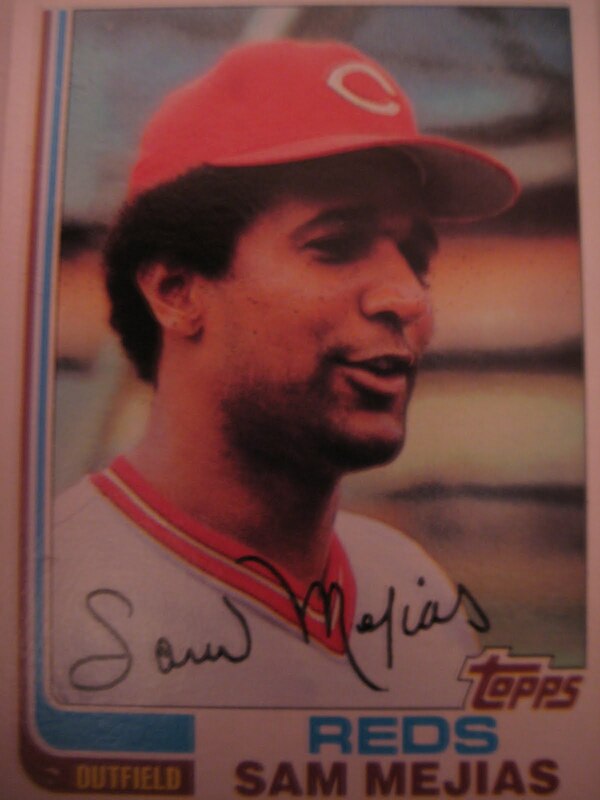 Sam Mejias interrupts the interview to complain that he is always wearing his batting helmets in photos, like this one from 1981. Heyer obliged, giving us the photo that would be in 1982 Topps. 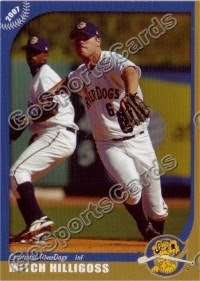 Drew Macias played parts of the 2007, 2008 and 2009 season with the San Diego Padres. 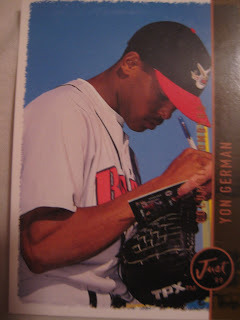 Currently an outfielder in the Arizona Diamondbacks organization, he kindly answered my questions about baseball cards. Anyways I had a lot of good times collecting cards as I'm sure you do...as for me my favorite card of me is the only one I have...just one...but I'm working my tail off to change that and have more." Mike Aldrete's awkward swing may have just resulted in a foul ball in the dirt, but the photographer got a real nice picture of the dirt exploding under the ball. If John Henry and his Johnson had spent less time posing for inappropriate baseball card pictures and more time practicing pitchers, he could have won more than 26 major league games. I wonder if when the photographer asked for his name, he said Mike Hunt. Of course, he could have meant 1930's minor leaguer Mike Hunt who hit over 200 home runs in the minor leagues, but never made the big leagues, perhaps because of his unfortunate name. 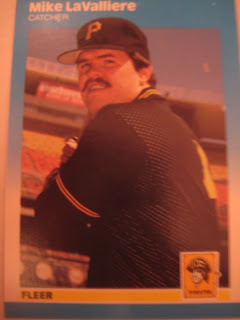 Mike LaValliere played twelve seasons in the major leagues, mostly for the Pittsburgh Pirates, for whom he won a Gold Glove and was the regular catcher on three straight NL East champions. Now the owner of the Big League Experience instructional facility in Sarasota, FL, he kindly answered my questions about baseball cards. 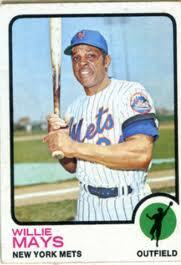 "Stories - just messing with the camera guys but I took a couple of pictures hitting right handed in certain years. 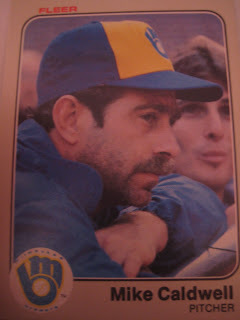 Favorite Card - I'm probably a little partial to my Topps rookie card. Collect? No, never was into collecting. I do have some special memorabilia however that I have at my house. ie. Michael Jordan and me by the batting cage during his try at baseball. It's personalized with a quite funny quote from him." 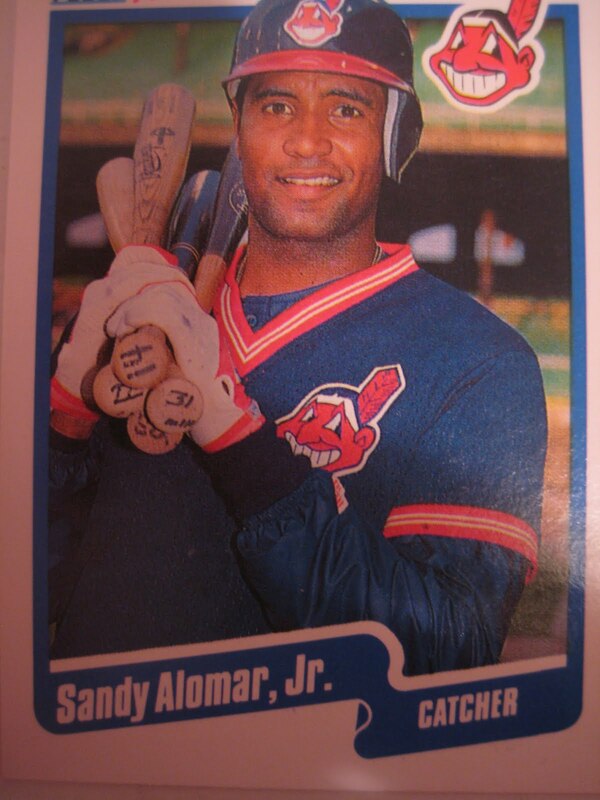 Judging by this picture, it seems that newly-acquired young catcher Sandy Alomar was forced to lug everyone's bat. 14 is Jerry Browne's bat, and 22 would be Candy Maldonado's. #31 on the 1990 Indians was relief pitcher Steve Olin - perhaps it was a leftover Pete Dalena from 1989? Can't read the number on the last one, but at least it doesn't look like it says "$@!# face". Mitch Hilligoss was the Yankees sixth round draft pick in 2006. Traded to Texas for Greg Golson before the 2010 season, he hit .296 at A and AA this year. He kindly answered my questions about baseball cards. 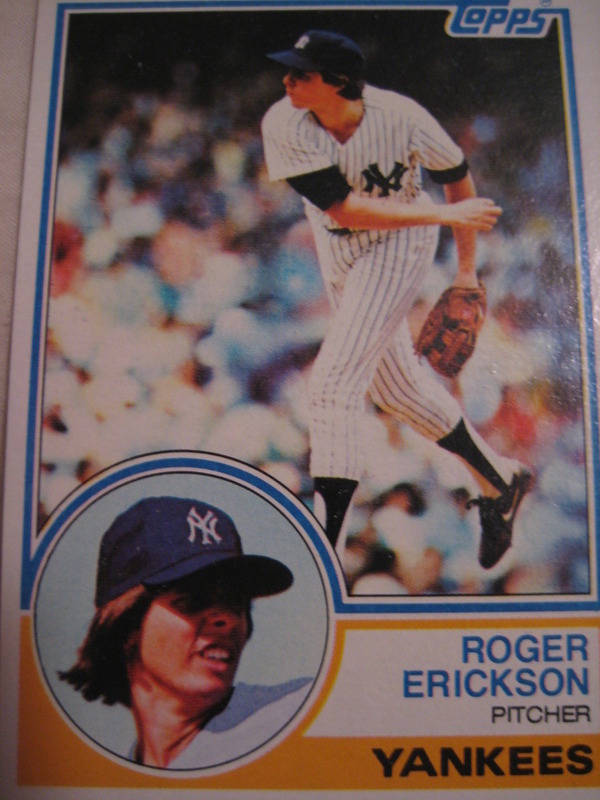 The one card I have is of me when I was a Yankee. Its a special one I guess it has a signature on the bottom. The problem is every time I look at it, it bothers me because it isn't my signature. I have no idea where they got the signature or who's it really is, but it is not mine, only my name. It's just kind of funny, everything else matches though. 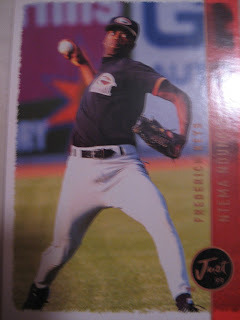 My most favorite card is the prospect one of me that is shiny when I for the Charleston Riverdogs. 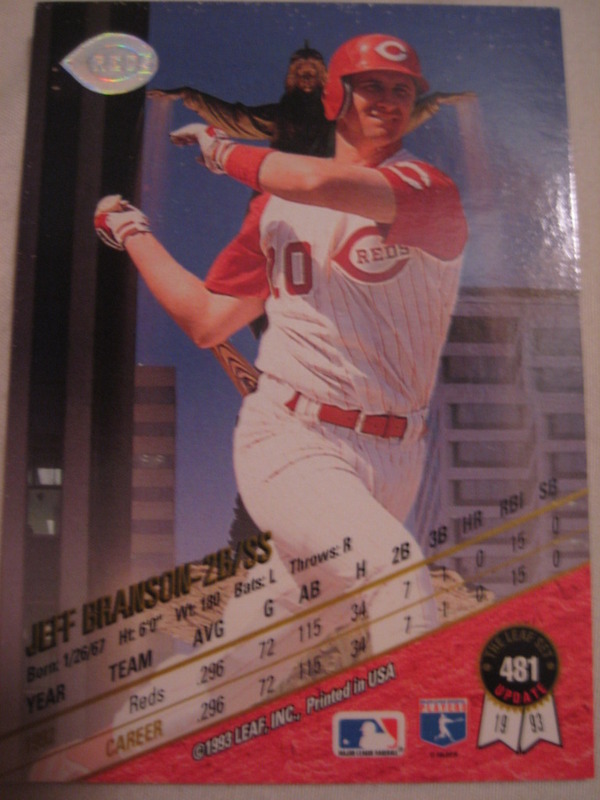 Partially because I like the style of the card and partly because it brings back great memories of a good year. I have a few baseball cards, but not many. 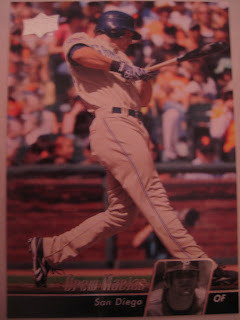 I do however frame the cards given to us from the affiliate every year. It helps remind me who I played with and some good memories. Hopefully, there will be many more to gain and many more to collect. Third base, the "hot corner," sure is a pressure packed position. Here Greg Smith fields a ball in spring training, knowing that if any ball gets past him, it will probably break the windows on that car parked down the left field line. 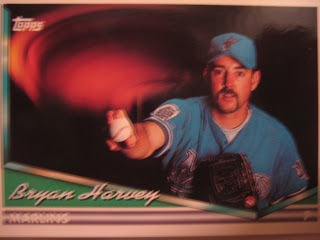 What was Bryan Harvey doing with the baseball when this picture taken? Judging by the vapor trails, it would appear he was waving it around in a circle. And who is this witch with vapor trails as she raises her arms up? It's actually not a witch or vapor trails but a fountain/statue in Cincinnati called The Genius of Water, but it looks pretty creepy hovering behind Jeff Branson. The statue is actually kind of relevant for a baseball card, because it is turned on for the warm weather each year on the day of the Reds' first home game. 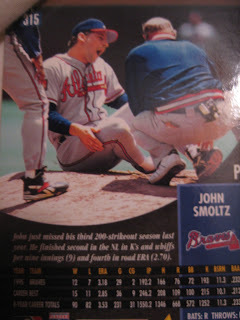 Pinnacle made an odd choice with this photo of John Smoltz on the back of his 1996 card, as he is tended to by the trainer on the mound after an apparent foot injury. I couldn't find mention on the internet about this injury, so I presume it wasn't serious. 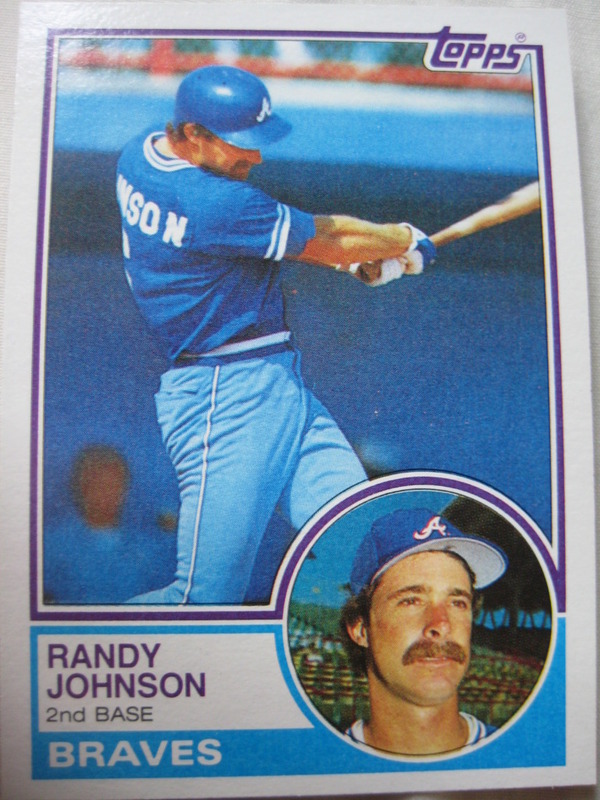 That's better than the photo of Randy Tomlin they used two years earlier, showing his career-destroying elbow injury. 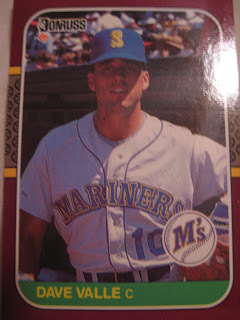 Got some cool minor league cards from 1999 Just in my trade with Scott Crawford. This is a fun picture. He has a great name too - Yon German. More standard picture, but even better name. Ntema Ndungidi. 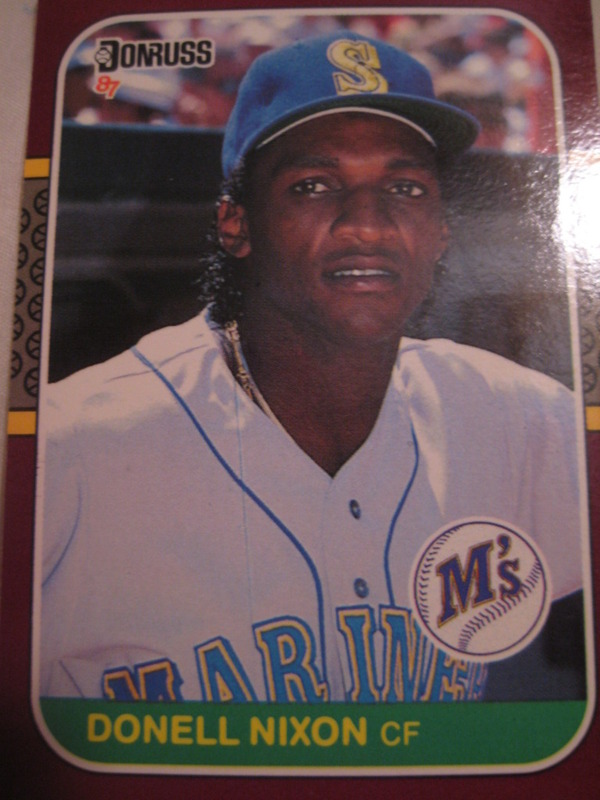 Possibly the only pro baseball player born in Zaire. 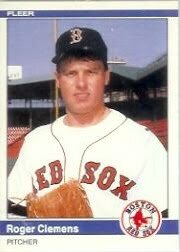 John Trautwein pitched in the Expos and Red Sox organizations from 1984 to 1990, making the major leagues with Boston in 1988. Since his retirement from baseball, he has gone on to a successful career in the business world, and is currently President & Chief Operating Officer of Source Support Services, which provides global service and support for IT manufacturers. He kindly answered my questions about baseball cards. My 1988 Fleer card is my favorite because it was taken in Fenway Park with the green monster as the background. - I don't collect now, but I did when I was a young boy... and of course gave them all away!" Thanks! Looks like his favorite card is a Steve Babineau shot. Got a bunch of this odd set from my trade with Scott Crawford. 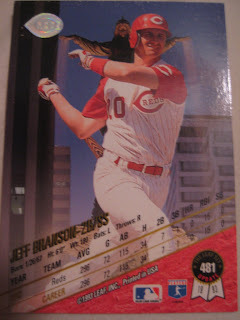 Apparently the purpose of this set was to have a card for each player in the opening day starting lineup for each team. I'm not sure how this was marketed, it's a bit of an odd concept. One interesting thing is that some of those pictures must have been taken on that opening day, like these Mariners, who were in Anaheim that day. Also, some of these photos must have been taken at the same time as the ones used in the 1988 set. 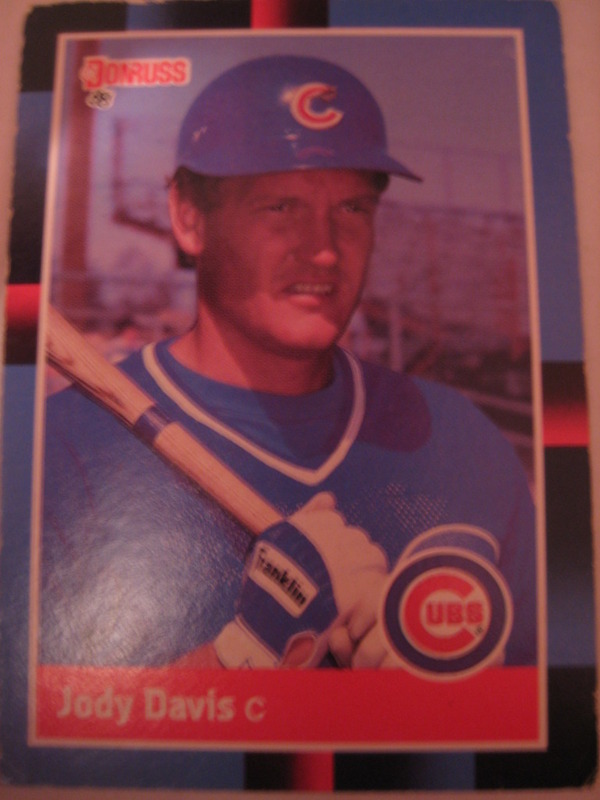 On Jody Davis's card this is particularly noticeable. When I got this 1990 Post card of Wade Boggs from Scott Crawford, I knew it looked familiar. 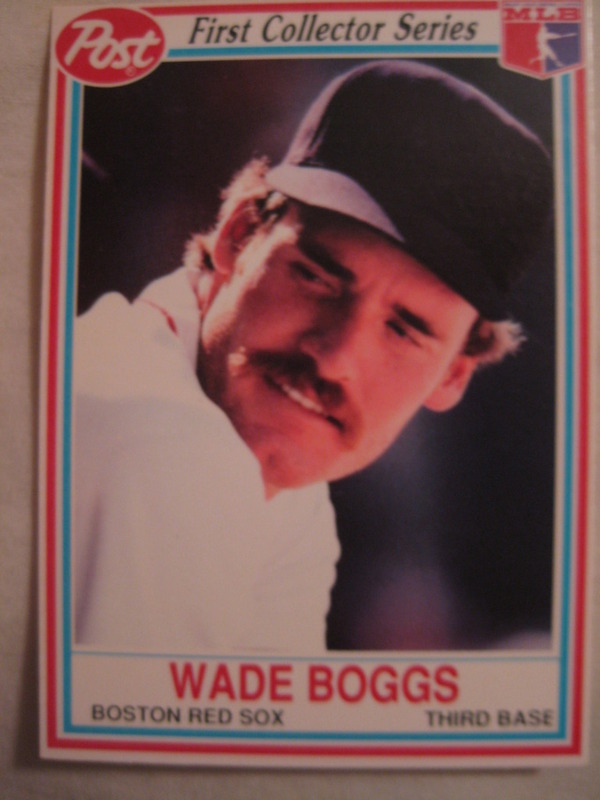 Turns out its the exact same photo from his 1988 Nestle card! Did Post, then owned by Philip Morris, pilfer a photo from Nestle? 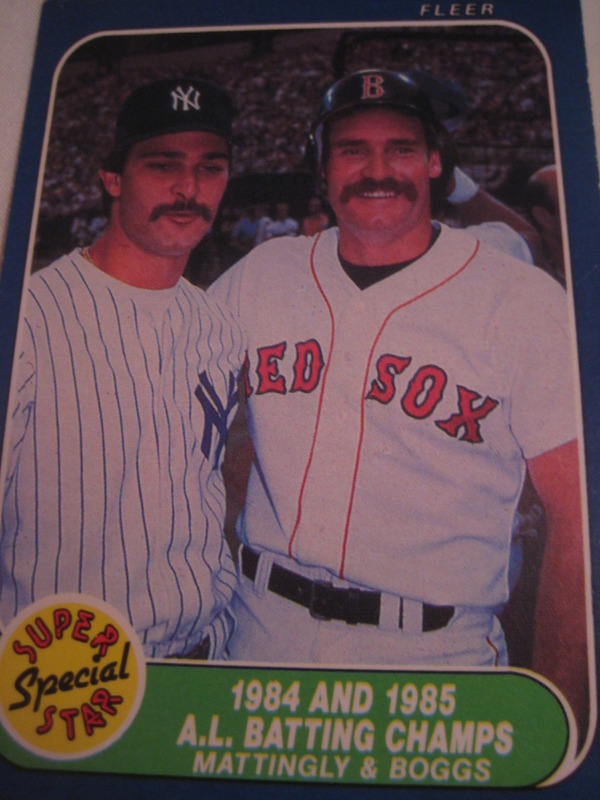 Or, more likely, did they just both get the same photo from House of Airbrushed Baseball Pictures? Last week, while looking up Steve Babineau in preparation for my interview, I came across Baseball Digest's January 1987 issue. 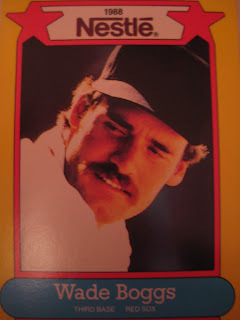 According to the article inside, Hitting of Wade Boggs, Don Mattingly, One of Highlights of '86 Season, the cover photo was taken by Steve Babineau. 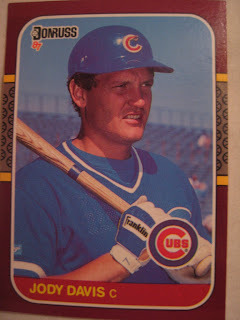 Later the same day (or maybe the next, I forget exactly), I got my trade package from Scott Crawford on Cards. One of the cards in that package looked very familiar. Steve Babineau, owner of Sports Action Images, is team photographer Boston Bruins and Boston Celtics and staff contributor to the Boston Red Sox. One of the original baseball card photographers for Fleer, he shot pictures for their baseball cards for fourteen years. 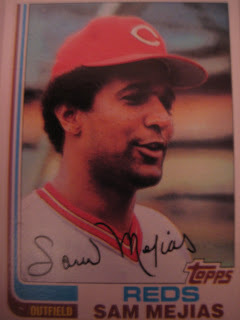 I interviewed him by phone yesterday and he shared with me some really interesting stories about his baseball card experiences. - Do you have any stories about cards whose pictures you have taken? I worked for Fleer for fourteen years which was pretty cool, especially the first five or six years when we did a lot of portraits and combo cards with multiple players. When I was interviewing with Fleer I showed them some old cards like this, such as one with Mantle and Berra, and said we ought to start doing this stuff. 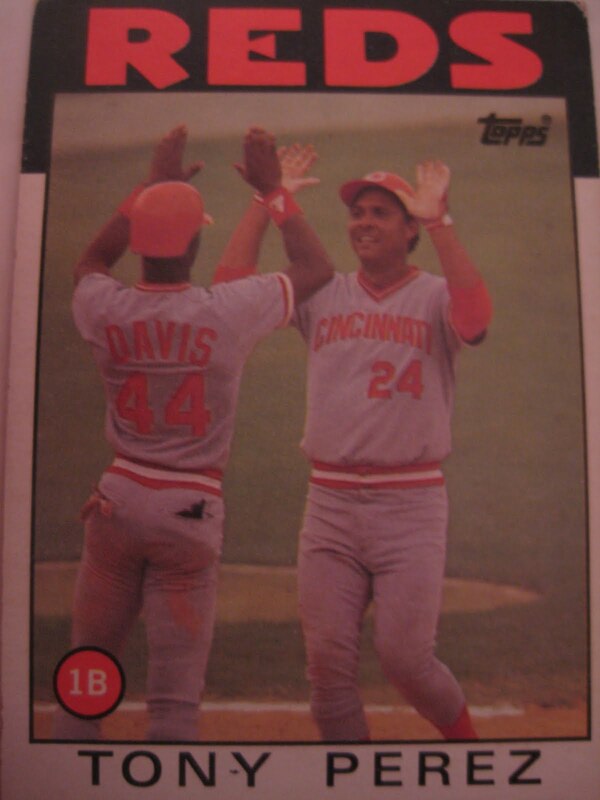 One example of this was the George Brett/Gaylord Perry Pine Tar card. 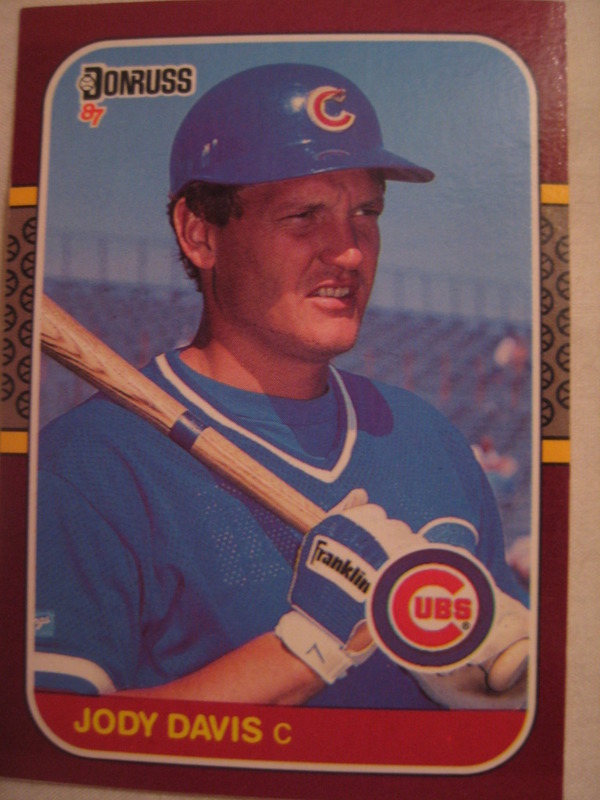 Perry was the one who hid Brett’s bat during the pine tar incident. I was taking Perry’s picture during BP at Fenway Park and we were chatting. I said it would be great to get a picture of you and Brett with the bat. Perry got Brett, they went into the dugout and we took the picture. I started with Fleer when they started doing baseball in 1981. I have been the Bruins photographer for 38 years and at that time was looking to fill some time during the hockey off-season. 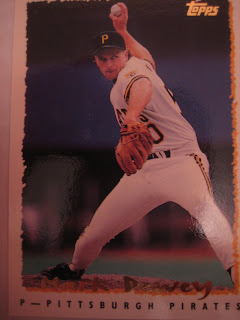 My buddy told me Fleer won its lawsuit against Topps, so I called Fleer, and two days later their executive flew over and interviewed me in my kitchen. We had a handshake deal and I took him upstairs to my sports memorabilia room where I showed him my display case with old cards and told him my idea for bringing back these classic poses. The combo-player cards were my idea. 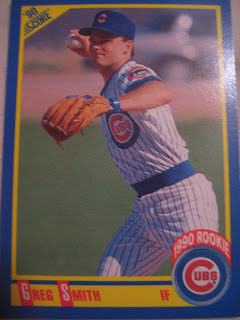 I shot the Billy Ripken card – it was definitely not intentional. I was at Fenway, and everyone is out there doing BP. Billy is the only one wearing a game uniform with the number in the front. Everyone else is wearing their orange BP top. For everyone else I would need to make sure there was an identifying marker like a glove, or I would take their picture as they walked away to get their uniform number. 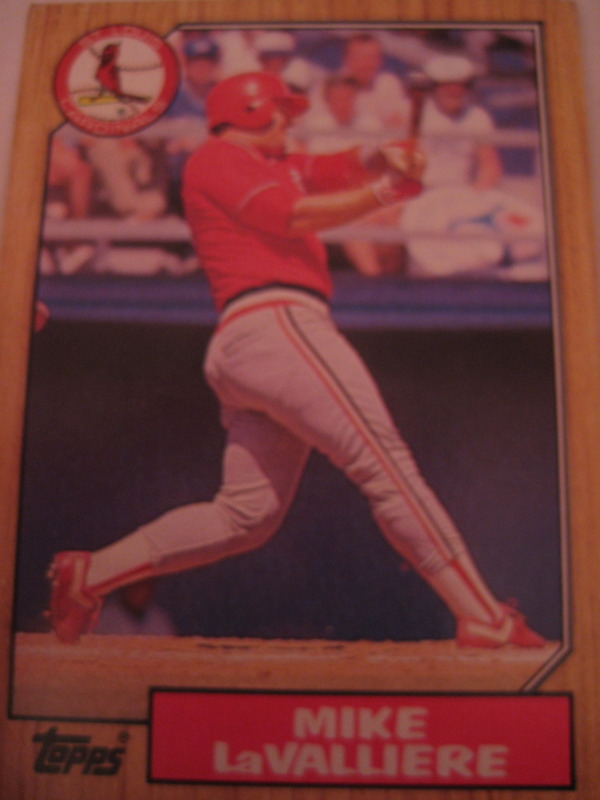 I didn’t have to magnify Ripken’s card because the number was clearly visible. 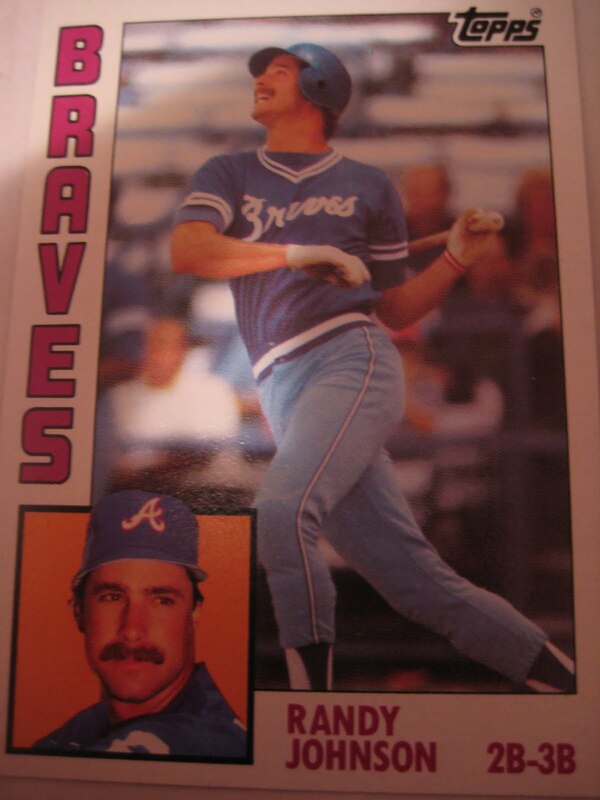 In the past Fleer used to send us full color sheets, which we would use to check for reverse negatives and other problems with the picture. That year, to save money, they just sent us blueprints that were in three shades of blue. Your eyes don’t focus on something like that. After the card came out, my boss called me and told me to look at the knob of the bat. “Please tell me it says ‘slick face,’” he said to me. I had to look at it with the magnifying glass and tell him that that was not what it said. 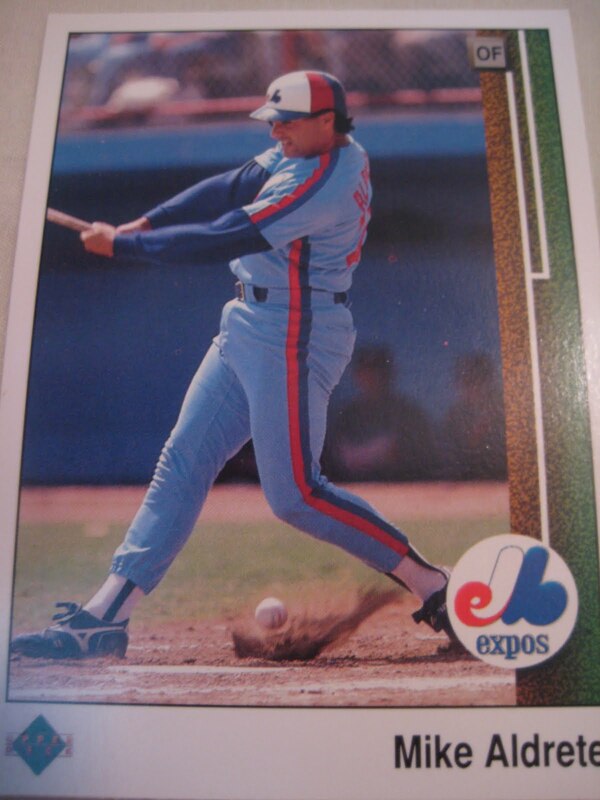 The next year the first team I went to see at Spring Training was the Orioles, playing the Expos in West Palm Beach. I went up to Billy and he says “Thanks for making a nickel card into a thirty dollar card!” He told me he started using that bat as a BP bat on a road trip in Detroit or Cleveland before coming to Fenway. He said it was his brother that wrote that on his bat. I heard that he actually started signing that card for kids but had to stop. Another time in spring training I was taking pictures of the Tigers at Lakeland. I asked Mark Fidrych to pose and he said he would come back out in his white uniform. I waited five or ten minutes for him to come out. He finally comes out and we take a bunch of pictures, when all of a sudden I notice that he is wearing a glove for a left-hander! He said come on, come on, let’s go with it, but I told him I would get in trouble and we couldn’t do that. 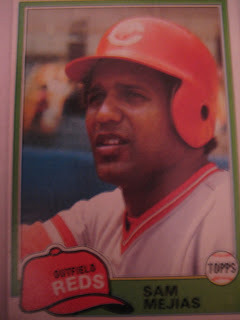 - I have noticed that there were more interesting pictures and poses in the first four or five years of Fleer then later on. 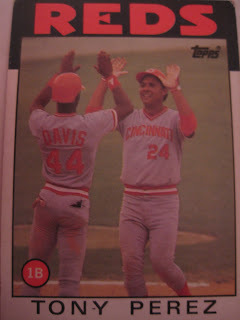 I liked to do some posed things with guys bats – bring back some classic poses. There is a photo of Steve Garvey extending his arms during batting practice at Tinker Field in Florida. I became one of their main guys in dealing with this stuff. At the time Topps was doing all action shots, but every action shot looks the same after a while. I was more interested in doing candid shots, shooting more posed things. What ended up happening after a while, when there became so many card manufacturers, is media days. There is a standard backdrop, mug shot type of thing, but not the creativity of an individual photographer. Here is another great story from those early years. I was shooting the Astros and Expos in Montreal, and wanted to get a photo of Nolan Ryan. I didn’t realize he was going to pitch that game. I wanted to do something special because he was my idol and he just broke Walter Johnson’s record. He’s out there doing BP because pitchers batted. I told him I wanted to get a picture of you holding this baseball with the strikeout number. He says to me, “why don’t we do it in the bullpen in my uniform.” When it come time for him to go out to the bullpen he sprints out there – totally forgets about me. I totally understand – game time, game face – no big deal. The game starts. In Montreal, unlike most ballparks, the photographer’s pit was closer to home plate – in the visual line of the pitcher. There are two outs in the inning and Ryan went to 3-0 on this batter. All of a sudden he sees me in the pit, slaps his glove against his thigh and says “Goddamn it.” He throws three bullets to strike the guy out and then comes over and apologizes to me and says we’ll get the picture after the game. Unfortunately I had to leave after the fifth inning to drive back to Boston. I did get a picture of him holding that ball the next spring training, but I don’t know if it was ever used. 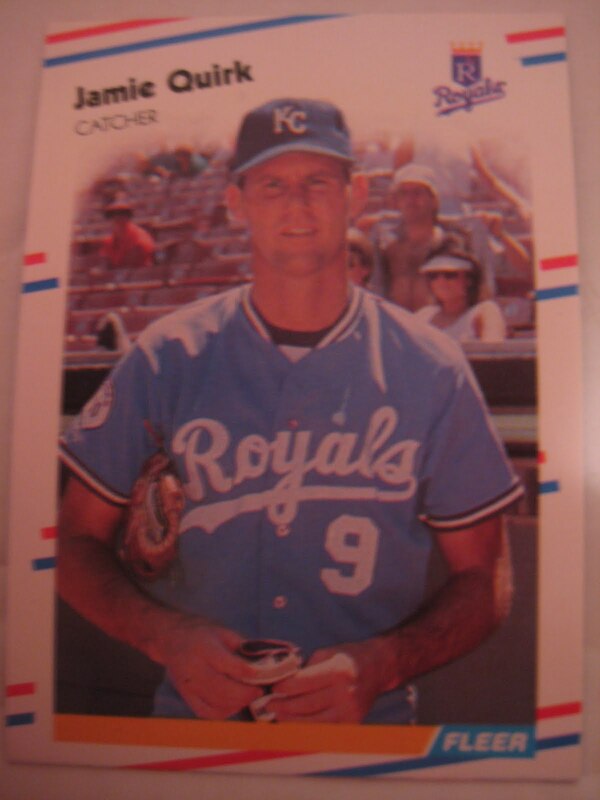 We did do a no-hitter card with him and Alan Ashby. For the first five or six years it was all new to the players. After a while, with more and more card companies it got monotonous for them. 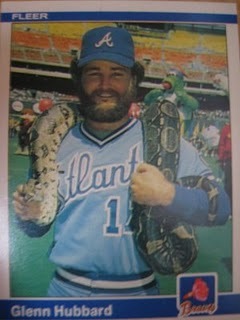 I would go up to a player in Boston and give him my business card, asking to take a picture for Fleer. They would say “They just took my picture in Cleveland.” I would have to explain that that was for a different company and not Fleer. After a while the card companies drifted away from that posed material and just went with action shots. To go up to a guy like David Ortiz and ask him to pose is insanity. In the old days I would just be out on the field and wait until they finished their BP. You can’t do that anymore. 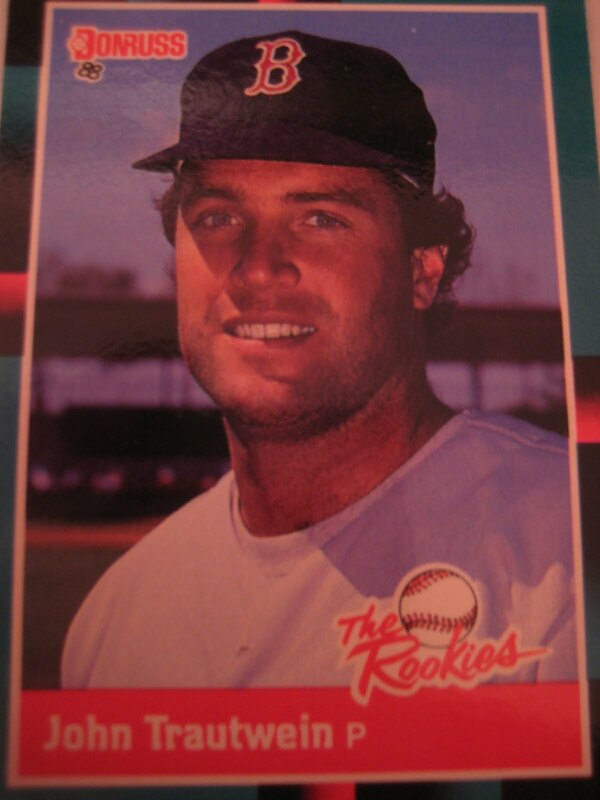 I did Roger Clemens’s rookie card – he posed by the dugout. 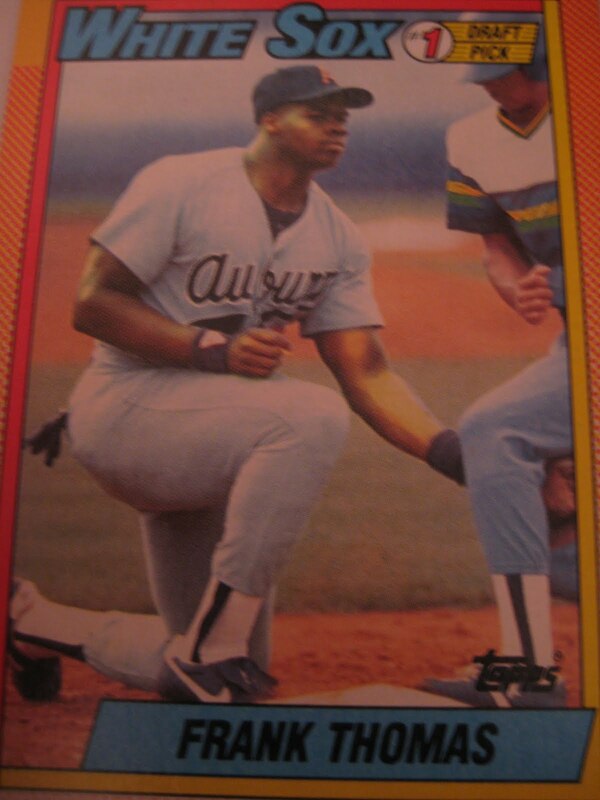 Darryl Strawberry’s rookie card – posing on one knee in Montreal. I got a great shot of Gary Carter posing in Montreal. Carter collected cards – he knew me and when he would see me he would go out of his way to ask how I was, ask how my kids were. Now I am one of five Red Sox photographers and that is unheard of. 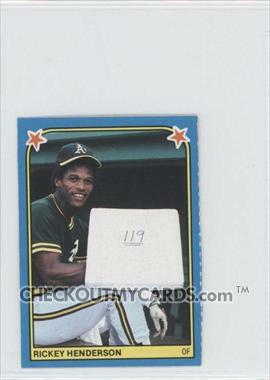 Another story – there was a Rickey Henderson card, when Rickey was going to break the single season record for stolen bases in 1982. I got Rickey to pose at the end of the Fenway Park dugout with a base with the number 119 on it – two days before he broke the record! I said to him, you know you’re going to break the record, and I’m not going to get a chance to do another picture of you this season. He said “OK, but let’s go down to the end of the dugout where no one will see us." - What cities did you cover? 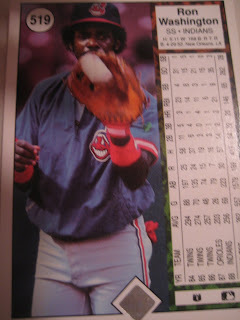 How would we know which Fleer cards are yours? I shot in Montreal, Boston and Toronto, as well as two weeks of spring training. 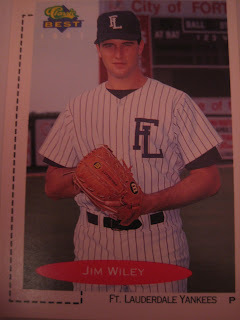 I would stay in Orlando – this is before Disney had a team – and I went to the Reds, Astros, Royals, Tigers, White Sox camps- Kissimmee, Plant City, Winter Haven. I would also do a trip to Vero for the Dodgers and Tampa for the Yankees. It was two weeks of vacation with the kids and family, but I would shoot 4,000 to 5,000 pictures. Shooting was easy – editing that number of pictures was a pain. 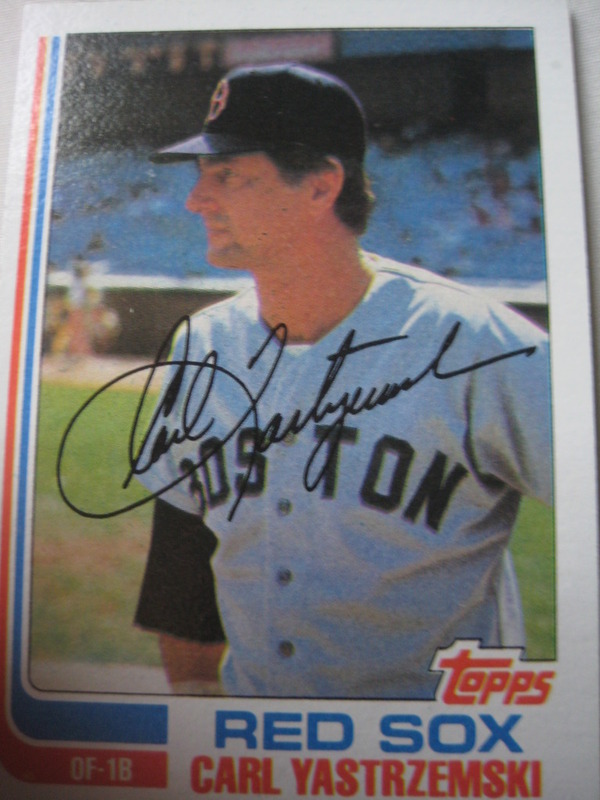 - So you didn’t do the famous Glenn Hubbard card – that was in Philadelphia. 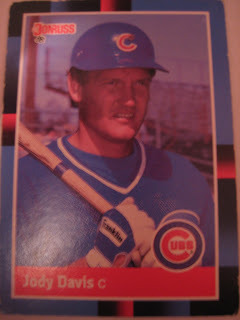 That was Bob Bartosz. I heard he got some crap for that – Hubbard didn’t care for that card. I always wanted to go to Montreal to see the National League because otherwise I only saw the American League once the season started. - Do you have a favorite card? I liked when you could get a superstar like Garvey or Carter and get something unique or classic. That Garvey is one of my favorites. 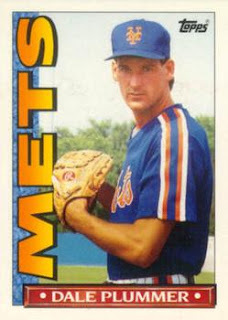 To have Clemens’s rookie card is cool. 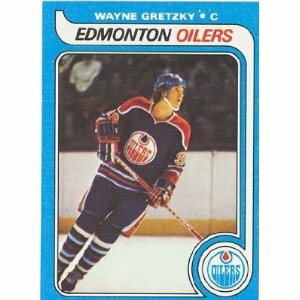 In hockey both Gretzky and Lemieux’s rookie cards are my photographs. Don Mattingly’s is mine. It was during BP in Fenway in his blue top playing first base. Guys like George Brett would do poses for you earlier on. After four or five years it got more difficult to get guys to cooperate. Also, the emphasis shifted towards actions. MLB made standard headshots available for a flat fee, so card companies would just use those. Thanks! Those were some really great stories! 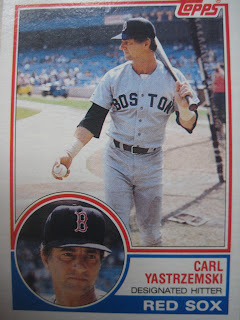 I plan to go through my Fleer cards over the next few days and look at cards in Fenway, Montreal, Toronto and Florida spring training for interesting individual cards to ask him about. If there are any cards you want me to ask him about, just let me know.